The International Organization for Standardization (ISO) creates protocols, specifications, and guidelines for many measurable variables that are upheld by environmental health and safety regulations, such as facility monitoring plans. 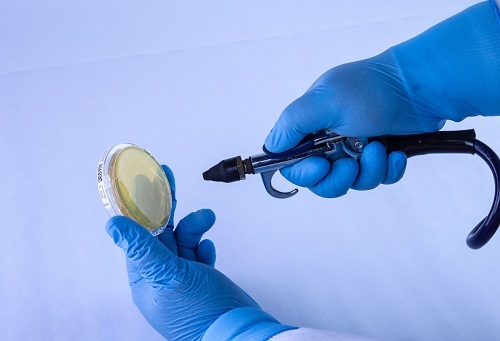 One such standard is ISO 8573, which discusses the specifications and protocols to test compressed air; part 7 of the 9-part standard focuses on microbial testing. ISO 8573-7 requires quantitative results by evaluating compressed air microbiological bioburden, or the microorganisms present in a specified region or volume. It does this by mandating specialized equipment and types of microorganisms to investigate. The normative protocol, Annex B of the standard, requires that an impaction air sampler be utilized to obtain quantitative results via total plate count per cubic meter (1000 liters total volume) from the sampled compressed air.2 ISO 8573-7 pertains solely to compressed air. While there is no mention of compressed/inert gases in ISO 8573-7:2003, the protocol is completely adaptable and relevant. Additionally, the procedure does not contain any test sample specifications for microbial limits, it does however, specify controls to be free from contamination. 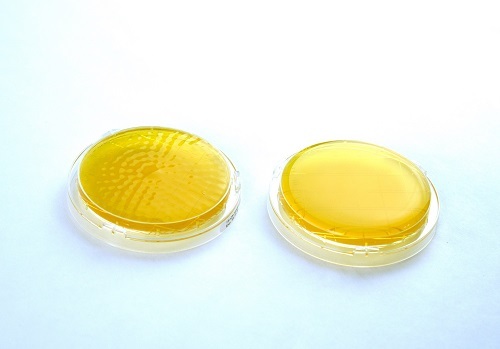 The microbial media used for total plate count can be broad spectrum or selective; bacteria and fungi (yeast and mold) can grow on the broad spectrum (tryptic soy agar - TSA) and select organisms on selective media (sabouraud dextrose agar – SDA) respectively. Discuss appropriate microbiological media with an accredited testing or 3rd party laboratory. Quantitative microbial analyses report quantities of microorganisms in a specified volume or area. Calculations can be used to extrapolate data for a larger volume when a smaller volume is tested, allowing the found microbial burden of a sample to be applied to the entire compressed air system. Quantitative microbial testing methods of compressed air and gases can be used for qualitative microbial methods and analyses, as is the case with total plate counts. However, the opposite is sometimes not true; most qualitative methods cannot be extrapolated for quantitative results. Qualitative microbial analysis is a yes/no, presence/absence, report for microbial contamination. When assessing which instrument to use for air sampling, always consult the original equipment manual for confirmation and validation documentation. The manual will always state the equipment’s capabilities. Figure 1: An example of a compressed air microorganism testing kit for quantitative analysis according to ISO 8573-7: SAS Pinocchio Super II. Choosing a method for testing microbial contamination in compressed air and gases requires evaluating which results the facility is requesting. Does the facility simply want to know if Listeria is present, or does it require a total plate count from a measured amount of air? When designing a monitoring plan around ISO 8573-7, effort needs to be made to choose appropriate sampling procedures. This section will focus on various methodologies that can negatively affect your compressed air monitoring plan and ISO 8573-7 report. Whether validated to compressed air specifications, quantitative measurement, and/or qualitative insights, choosing the wrong sampling method can result in a failed audit, incorrect data extrapolation, or an ill-advised recall or production halt. Make sure that the testing method is validated to the facility’s desired reporting needs. If the facility or regulations require results that denote a measured numeric microorganism total (quantitative analysis), be wary of methods not validated to any specification or quantitative measurement for the subject being analyzed, in this case compressed air/gas. 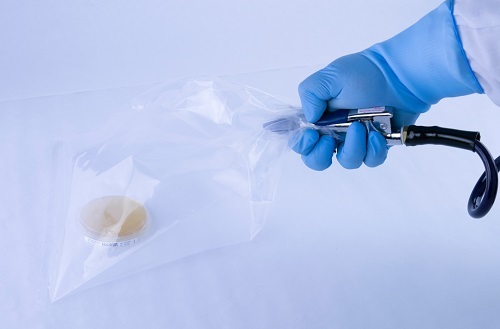 The ‘Bagged Agar Contact’ method consists of spraying compressed air/gas through a hose inside a sterile bag, while simultaneously aiming for the sampling petri dish. An alternative to this method is spraying the air on a disinfected surface and then stamping agar from the contact plate on that surface. The first method results in direct air contact with the plate, while the second is passive, meaning no measurable airflow contacted the surface of the plate. Alternative environmental sampling procedures, like the one described here, are not suitable for compressed air/gas testing. Figure 2: A “Bagged Agar Contact” sampling method that does not yield validated quantitative or qualitative results. Figure 3: Example of a sampling method that does not yield quantitative or qualitative results due to environmental contamination and inability to measure compressed air volume. There are a few problems that can result from testing in these manners. First, there is no flowmeter to accurately and precisely measure the flowrate of the air blown into the sterile bag. Therefore, there is no way to confidently state how much air was sampled onto the media. Additionally, the inability to control and measure the flowrate can result in the agarose surface becoming damaged by excess air velocity. The petri dishes used for sampling contain a moist agarose base (gelatinous) to aid in the growth of microorganisms. Too great of air velocity can result in rapid evaporation which creates a poor environment for the microorganisms to grow. This can be reported as a false negative. Secondly, airflow patterns matter. If the pattern dispersed onto the plate is not allowed to escape appropriately from the airflow stream, the resulting sample will be an inaccurate representation of the system. Too much or too little of the sampled air can contact the plate, resulting in skewed data. Spraying compressed air onto a disinfected area is not an appropriate or useful mode of testing compressed air for microbial contamination. Similar to the case study above, mixing ambient air and compressed air results in false positives, cross contamination and inaccurate representations of the microbial burden (quantity) present in the compressed air environment. 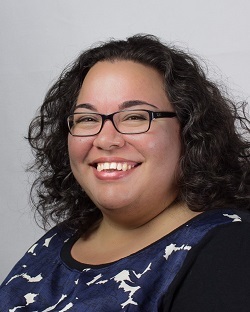 Is the Testing Equipment Validated to Reporting Needs? Supervisors of facility monitoring plans must read equipment manuals utilized for sampling compressed air or any facility variable, like environmental. Make sure that appropriate, calibrated and operational qualifications and documents are available for the results necessary to fulfill the method test. 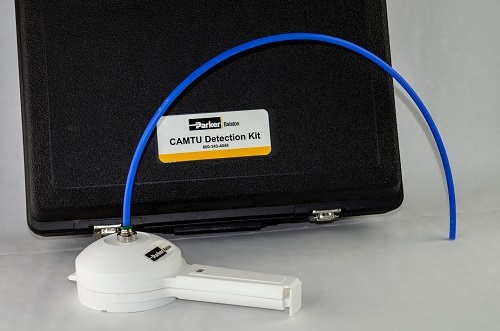 For instance, the Compressed Air Microbial Test Unit (CAMTU) offered by Parker Balston is a great qualitative tool to assess present or absent results of microbial contamination. However, the original equipment manual (OEM) specifically states, “Due to the airflow pattern inside the CAMTU, it is not recommended that CFUs get counted.”3 It’s good practice, when writing, evaluating, or executing monitoring plans, to ensure results are not reported or extrapolated that differ from OEM recommendations unless validation and qualifications have been conducted for the upgrade. Figure 4: An example of a compressed air microorganism testing kit for qualitative analysis (not validated for quantitative results): CAMTU by Parker. When reflecting on the Parker Hannifin case study mentioned above, it’s important to remember how the procedure went wrong: improper testing produced false test results. Be mindful of what is being tested and how external variables (ambient air) can influence test results. Using technologies or methods that are approved for surface environmental sampling, like surface swabs, should not be used for compressed air sampling. Again, mixing ambient air and compressed air or gas will result in corrupted data. The most expedient method is not always the correct method. An impact air sampler must be used to report colony forming units per cubic meter. Aseptic technique must be used. The tested media plates must include information that can be directly correlated to location, date, sampling technician, air type and air volume sampled. The facility must submit two blind plates that act as negative controls, before and after each point of use. A negative control that traces the geographic distance unopened from manufacturer, shipper, testing facility to final laboratory analysis. Choosing an unsuitable method for reaching total plate counts wastes valuable time and resources. 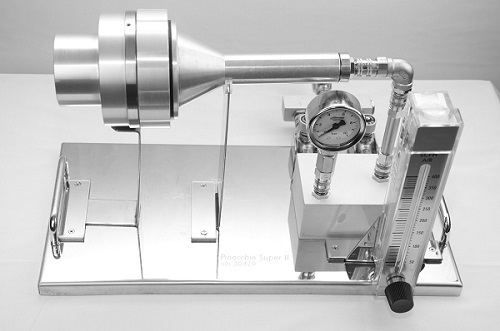 Research has produced a plethora of approved ISO 8573-7:2003 impact air samplers that are appropriate to use for compressed air/gas microbial contamination testing, like the Pinocchio Super II. Trace Analytics is an accredited ISO 17025 testing laboratory with a team of dedicated experts available to assist customers with compressed air standards and specifications. In addition to testing for microorganisms, Trace Analytics can also evaluate the remaining sections of ISO 8573 as they pertain to particles, water, pure gas, and oil analysis. Figure 5: An appropriate impaction sampler was used to diffuse air across the agar plate on the left. The contact plate surface shows dimpling after 100LPM at 10mins of compressed air at a point-of-use. The contact plate on the right shows an ISO 8573-7 blind(s). Microbial Detection System for Compressed Air Systems- Market Application Publication. Case study. 11/2014 Parker Hannifin Corporation. Trace Analytics is an A2LA accredited laboratory specializing in compressed air and gas testing for food and beverage manufacturing facilities. Using ISO 8573 sampling and analytical methods, their laboratory tests for particles (0.5-5 microns), water, oil aerosol, oil vapor, and microbial contaminants found in compressed air. For over 29 years, they’ve upheld the highest industry standards of health and safety, delivering uncompromising quality worldwide in accordance with ISO, SQF, BRC, and FDA requirements.